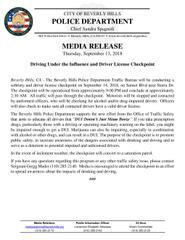 The Beverly Hills Police Department Traffic Bureau will be conducting a sobriety and driver license checkpoint on September 14, 2018, on Sunset Blvd near Sierra Dr. The checkpoint will be operational from approximately 9:00 PM and conclude at approximately 2:30 AM. All traffic will pass through the checkpoint. Motorists will be stopped and contacted by uniformed officers, who will be checking for alcohol and/or drug-impaired drivers. Officers will also check to make sure all contacted drivers have a valid driver license. The Beverly Hills Police Department supports the new effort from the Office of Traffic Safety that aims to educate all drivers that “DUI Doesn’t Just Mean Booze.” If you take prescription drugs, particularly those with a driving or operating machinery warning on the label, you might be impaired enough to get a DUI. Marijuana can also be impairing, especially in combination with alcohol or other drugs, and can result in a DUI. The purpose of the checkpoint is to promote public safety, to increase awareness of the dangers associated with drinking and driving and to serve as a deterrent to potential impaired and unlicensed drivers. In the event of inclement weather, the checkpoint will convert to a saturation patrol. If you have any questions regarding this program or any other traffic safety issue, please contact Sergeant Gregg Mader (310) 285-2140. Media is encouraged to attend the checkpoint in an effort to spread awareness about the impacts of drinking and driving.